Unlike Monday, Tuesday was a happy day. On Monday, I woke up with eyes full of tears after I fell asleep to a tragic story, a story that was not heard widely, but happened in Gaza. Three kids lit up a candle to escape the darkness that filled their house in Al-Bureej Refugee Camp in the central Gaza Strip and slept. As the candle burned out, the candle of their lives was extinguished, too. Nadin, Sabry, and Farah came to this life, to the bosoms of their parents, after 17 long years of medication and Blastocyst operations. Monday night was their last in the blackness of Gaza. They died in a blink of an eye, in a fire that turned the dark sky red, leaving their small, charred bodies behind. Their parents were shocked from the biggest calamity in their lives, but continued to thank God that a son survived. 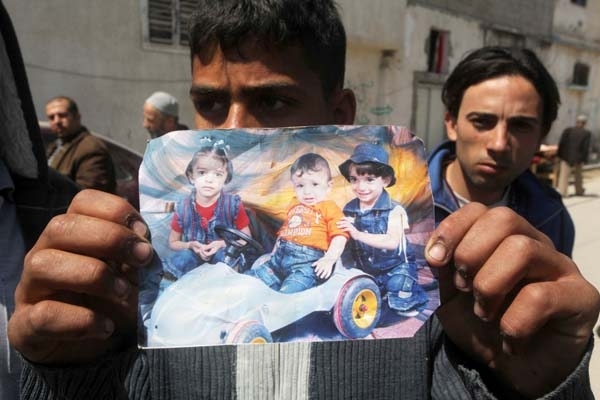 Their story offered another tragic episode of suffering and pain from Gaza’s siege and its fuel and electricity crises. But it also proved how inspirational and strong Palestinian people are. On Monday morning, the news was still fresh and hard to believe. Tragic stories of all kinds end up seeming normal. People here have learned to look back with anger, but keep going. So I had to go on, as life has had to keep moving in Gaza no matter how many obstacles we face. I had to attend my French class, even though I wasn’t in the mood to study. I sat silently, then started drawing, seeking some relief. Our lesson was on how to say “I wish” in meaningful French phrases. I was there, but actually absent. Suddenly, one of my classmates joked that her only wish was for electricity to stop cutting off. While laughs could be heard from every corner of the class, the three kids’ deaths came to my mind. I got emotional, raised my hand, and said, “I wish these power-cuts would end so kids like Sabry, Nadin, and Farah wouldn’t die because they had to light candles in their dark rooms.” My intense emotions made me need to speak Arabic, even if that wasn’t the reason for the class. I knew many of my classmates had slept early, because of the blackout, and wouldn’t have heard about it. I always feel blessed to have this great man as my teacher and friend. That day, I felt this blessing even more. He made my day. Then many beautiful and happy incidents happened. My youngest sister, Tamam, and my eldest brother, Majed, surprised us with their arrival back in Gaza after spending a month in Europe representing Palestinian youth in some events there. The house had felt empty without them. I missed them a lot during their absence and they filled the house with happiness on their safe return. Tuesday was very special. My family is very close, but I guess Tamam is my closest sibling. She is two years younger than me and studies at Al-Azhar University, like I do. Since her first day in university, we went to school together. It felt lonely to wake up in the morning and find her blankets well tidied on her empty bed. It didn’t feel right going to school without sharing a taxi, and without joking with her during our shared breaks. But on Tuesday morning, everything returned to normal. Having her around makes me happy to an extent she doesn’t realize. Tuesday brought more happiness as I took the opportunity for a long break between lectures and visited the sit-in tent in front of the International Committee of Red Cross (ICRC). The shortage of taxies caused by the fuel crisis offered me with a beautiful walk to the ICRC. At 10 am, the weather was almost perfect, and the Gaza streets seemed tempting to walk on, and very full of life. The drivers’ constant honking in the streets, for any reason or none, used to bother me. But on Tuesday, it made me smile. I enjoyed it as if I was listening to music. From 50 meters away, I realized that the sit-in tent was gone. But I kept walking, as I could see a crowd of people in the front of the ICRC. As I got closer, I realized that they were the same people whom I always meet in the solidarity events held there. There were former detainees and mothers, wives, and daughters of current prisoners who are still held in Israel’s prison. This event was organized in anticipation of April 17, Palestinian Prisoners’ Day. I was lucky to join the event from the start without having heard of it. It was very different than the ones we usually have. It included people like Om Ibrahim Baroud, whose son has been in prison for 27 years, a mother who had four sons in prison at one time during the First Intifada, the Intifada of Stones, along with her husband, and whose house was demolished twice by the Israeli occupation forces, and who hasn’t been allowed to see her son for 9 years. People like Om Ibrahim Baroud were tired of chasing the human rights organizations and speaking endlessly for their relatives. 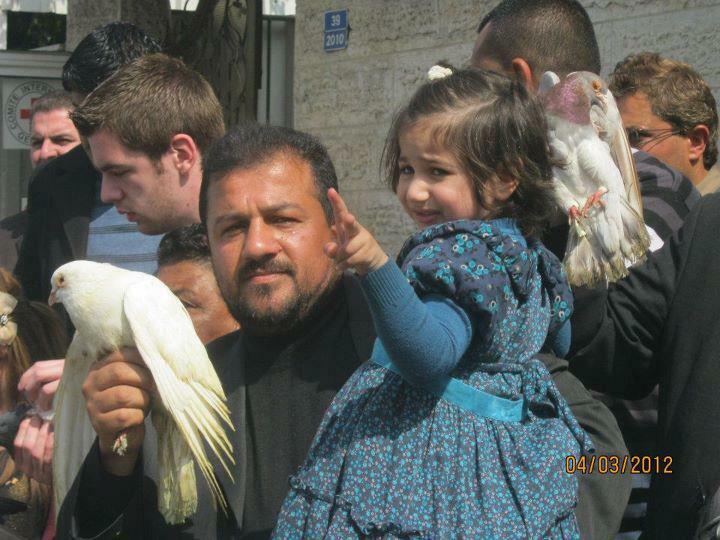 Tuesday, they stood with pride and bright smiles full of hope, holding white doves. I felt overwhelmed with happiness watching them let these doves fly free in Gaza’s blue sky. I don’t know where they settled, but hope they convey our message to our prisoners that they are never forgotten and to the world that Palestinian people are real people who dream of living freed and dignified, like free birds. I can’t describe the positive energy, optimism, and cheerfulness I felt with all these incidents happening one after another. My happiness doubled as I visited my new female heroine, Hana’ Shalabi, who challenged these oppressors with her empty stomach for 43 days and defeated their illimitable tyranny. I couldn’t believe I was sitting next to her. I was actually speechless from her inspiring strength and will. No words could express how much admiration and appreciation I felt for this Palestinian woman. I felt sorry that she was forced outside her land, Jenin, to Gaza, away from her family. But I was thrilled at her high spirit, enthusiasm, and determination to recover so she could be the tongue of detainees until the last breath of her life. 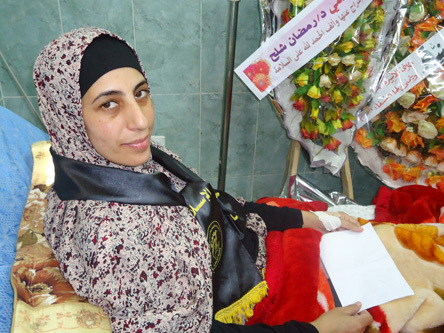 “I was released on the condition of deportation to Gaza for three years,” she said smiling. “I don’t trust Israel, though.”Then a released prisoner, who was deported from Bethlehem in 2002, interrupted, saying, “Previously in 2002, the people who were besieged inside the Church of Nativity were deported to Gaza, but promised that it would be for two years. It’s been eleven years now, and we still can’t return.” “Thankfully, every part of Palestine is my home, Gaza will be my home, and its people are my family,” Hana’ continued passionately. I am so sad that she has to deal with this situation, but feel very lucky and proud to have her among us. This is the spirit of Palestinian people. No matter how much Israel escalates their attempts to depress us, their plans are bound to fail and turn against them. They can’t break our dream to live in freedom and dignity. Their inhumanity does nothing but increase our humanity and make us stronger people, ready to take the challenge, to fight with all means to gain what we have always deserved: justice, freedom, and equality.